Bjelkeman-Pettersson talked to Circle of Blue during the Tällberg Rework the World Conference in Sweden about sharing information to change the global direction on water and sanitation issues. Thomas Bjelkeman-Pettersson, co-founder and technical officer of Akvo.org Click image to launch slideshow. Welcome to Circle of Blue Radio’s Series, 5 in 15, where we’re asking global thought leaders 5 questions in 15 minutes, more or less. These are experts working in journalism, science, communication design and water. I’m J. Carl Ganter. Today’s program is underwritten by Traverse Internet Law, tech savvy lawyers, representing internet and technology companies. 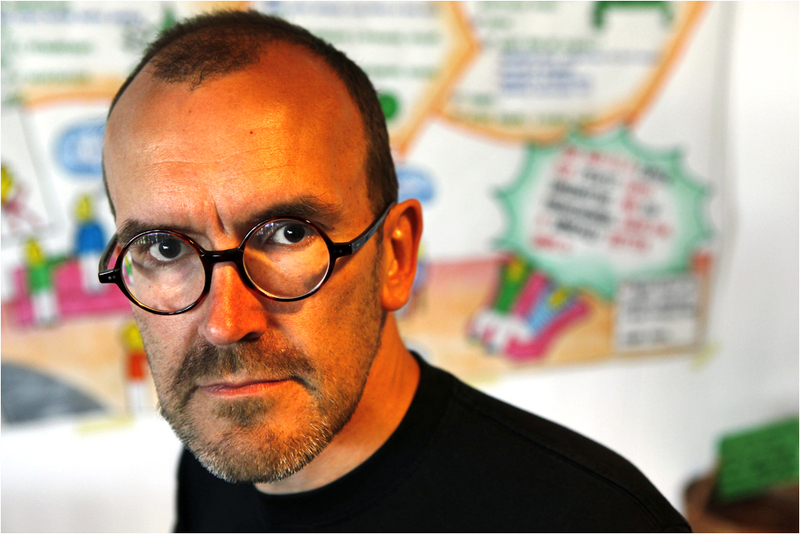 J. Carl Ganter: Our guest today is Thomas Bjelkeman-Pettersson, he’s co-founder and technical officer of Akvo.org, an online collaborative platform for tracking water development projects around the world. One of the most vexing challenges for development agencies is tracking success: what’s working and what’s broken, quite literally. Days, weeks, or years after a well’s installed in a small village, something as small as a broken rubber o-ring can leave the entire town thirsty. Akvo.org uses cell phones and other technology to help people get the help they need, including that new rubber o-ring, and bring a level of accountability to distant projects. They put a phone number on a water pipe or pump, and you text for help. I spoke with Thomas recently at the Tällberg Rework the World Conference in Sweden. Thomas, we’re at the Rework the World Conference and talking about all sorts of new ways of changing the world, resetting the world, changing our direction, coordinating and collaborating. It seems like Akvo is part of that whole mix, that whole calculation—tell me what Akvo does. 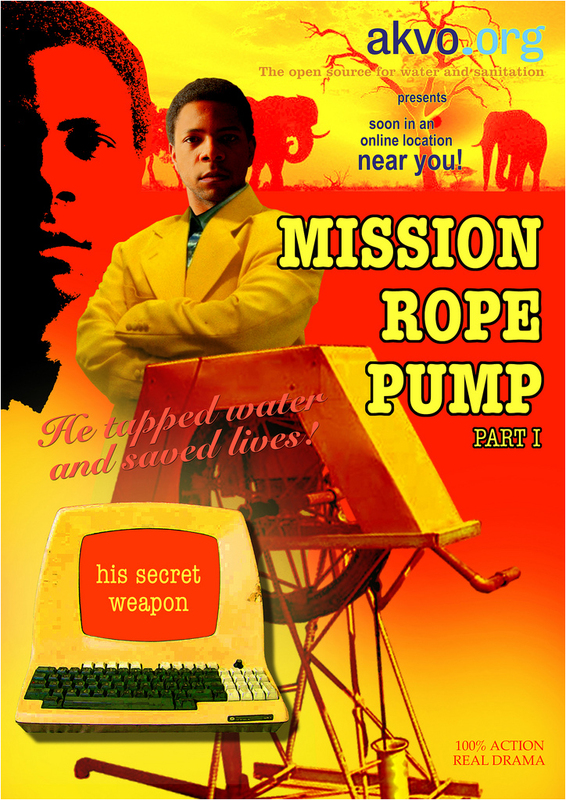 “Mission Rope Pump”. Designed by Vincent Wijers. Thomas Bjelkeman-Pettersson: Akvo is an online platform for connecting people that work in development aid. At the moment, we are working in sanitation. If you’re working with projects that help people that don’t have clean water and sanitation, how do you show what the project is doing? Europeans pay taxes, and that money goes to development aid, but can they see who got helped? Who’s being helped? Where did the money go? Who’s being helped? Where did the money go? The answer’s essentially: no, you can’t see it. Instead you get case studies. You get some examples of where the money goes, but you can’t see it. We built an online platform that essentially aims to give every project a voice. You should be able to go to our website or our partner’s that we work with, because we provide tools that allow projects to be shown on every website: what it’s doing today, and who’s doing what. Think of it as project updating for a Facebook generation. People who used to see a continuous stream of information from their friends, [or] from other things can also see it from developing aid projects. Tell me a little bit about the need for this. Where have we been in the last 20, 30 years? Water’s been a challenge—we’ve seen this coming. Where have we been? Have we been really in the dark as far as progress? Has there been this lack of connection? Are we entering this whole new world where we not only can connect, but we have to connect? Thomas Bjelkeman-Pettersson: We call it people are stuck in the thick word reports—everbody’s afraid of corruption. Are we doing the right thing? Has the money gone missing? They make these organizations that do the work in the field and make them write long reports—30 to 40 page reports—and regarding six to 12 months. I call them ‘cover your backside reports’ because they don’t really help anyone. One or two people read them, and then they go in and are archived somewhere to make sure that you can prove that you spent the money responsibly. Some small organizations that we talk to spend up to 50 percent of their time applying for money through proposals, and the other time reporting about the work that they’re doing. Only half the time—I mean this is anecdotal evidence, but half of the time,—or roughly a very large part, gets spent on stuff that is unproductive. We’re saying that with the new communication tools available, we should just make this so much easier, so much more transparent. We have market places for projects—think of it like Ebay for projects. Where are the great projects that need money now? We have market places for projects—think of it like eBay for projects. Where are the great projects that need money now? Twitter or Facebook for giving those projects the face. How is it going? We’re integrating one of our phone tools so you can use SMS services. Somebody in the field, in Guatemala, way away from Internet services, can use this mobile phone to tell the story of what am I doing today. Today we finished installing a road pump, we were here [and now] it’s done. It’s just five minutes later it can be seen on the project system, which has a little widget on their own website, which means that their website will always be up to date with the latest information. Do we need this stuff? Absolutely. Better transparency, but also what works, what doesn’t, where does the money go, who does good work [and] who needs help. Today we often see people make the same mistakes they made 30 years ago in doing these kind of projects. It’s essentially because we’re not good at sharing information about failures, and sharing even the information about what works. This is an attempt at trying to help with that. 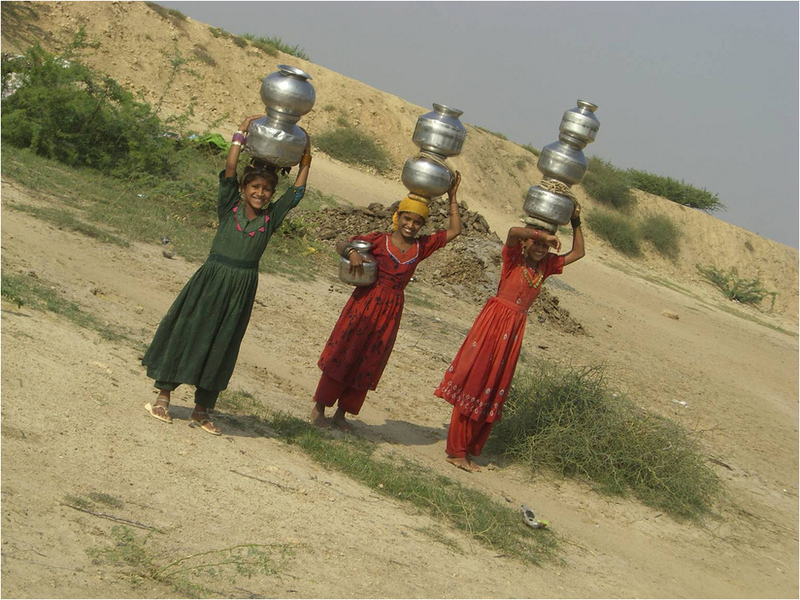 Budiya, Kutch, India. December 2008. Can you give me an example of maybe a failure that you saw that might not happen again now because of these new ways that we can stay connected? Thomas Bjelkeman-Pettersson: Absolutely. If you go to African villages and some places, I haven’t seen this myself, but the story’s often told, you can go to a village and there will be a Swedish pump that is broken that was installed in the 70’s and a French pump that was installed in the 80’s and a British pump that was installed in the 90’s, and they’re all broken because they’re all technology that’s flown in, installed, and there’s nobody there to maintain them. There’s no market to sell and maintain these things either because it’s all shipped in from far and abroad by foreign money. It’s not suitable for the local environment. We keep making these mistakes. Now we’re looking at, we have something called the Akvopedia on our side, which documents low cost, sustainable technologies for water and sanitation. It’s surprising for me, I’m an IT guy and come from the computer industry, a Silicon Valley type, and we didn’t have this type of information put together before. It’s not actually very difficult. Now we have hundreds of technologies documented properly and it’s open. People treat information as it’s a precious something that needs to be nurtured and protected. We’re saying no, turn it around. Let’s collaborate on this stuff. Let’s make it better together, because [many] eyes can fix all the problems in a much better way than a single editor. So the many eyes can also provide a level of transparency and accountability but also instant feedback when a system is starting to fail once it’s been installed, I’m guessing, so that this would provide, in sense, maintenance feedback, so we need new o-rings for this system, rather than just letting it go fallow. Is there a feedback system like that? Thomas Bjelkeman-Pettersson: In the future, I can see that. We don’t have that today. An obvious thing is if you install a village level system or something like that, in villages more and more, people have mobile phones. In fact, people certainly have mobile phones before they have sanitation installation these days, and in some places people have mobile phones before they have clean water to drink. We shouldn’t see that. It’s a stupid thing. We should see it as an opportunity. Who’s going to react? Who’s going to do something? The possibilities are absolutely there. If there is a village level pump or something, and there is an issue and they don’t know how to solve that stick the phone number on the pump and say, this is where you get help if you need it. Of course you need the infrastructure to help deal with that. Who’s going to react? Who’s going to do something? The possibilities are absolutely there. Tell me a little bit about your passion. You’re clearly a self-described technologist, software guy. How did you become interested in water and global development? Thomas Bjelkeman-Pettersson: Working as a software guy, I’ve came to a conclusion that it was all about money. People wanted to become millionaires and make money quickly. At some point I got to a point where I’m sort of… the more money doesn’t make me happier. I looked around myself and I say, ‘This place is a mess. We’re messing up our environment. Billions of people go poor and are starving.’ I realized it wasn’t enough to say, somebody ought to do something. [And] maybe I could do something. I took some time off and started thinking what could I do. I didn’t end up in Akvo on purpose. It just happened that way, a chance meeting somewhere. It got us thinking, we have to do this stuff. My passion is there’s no point in complaining about this stuff, just do something. Is there enough commitment to address this challenge of the global freshwater crisis and these other pieces that intersect it? We look at water deficits within the next 20, 30 years. We look at some serious, serious issues. Is society, do you feel, going to step up with the level of commitment that’s necessary, the level of commitment and shared passion, but also in the level of pure money? Thomas Bjelkeman-Pettersson: I actually believe that this society will. We will fix these things, but it will be because the pain is too high. We start seeing that this doesn’t work anymore, and what are we going to do. Everything’s going to be a little bit too little, too late kind of a thing that’s happening, but we are going to get there in the end because we just have to. In general, that’s what we tend to do. We don’t react until there’s a crisis, then we slowly get moving. We don’t react until there’s a crisis, then we slowly get moving. It’s a difficult thing to get there, but in the end we tend to do what needs to be done. That’s how I look at it, but that doesn’t mean you can sort of sit back and relax and say, ‘well, somebody else will do it,’ because actually the issues are so big in front of us that everybody needs to participate. So the big stories, what are we going to see in the next five years? What’s the big story for water and sanitation? Thomas Bjelkeman-Pettersson:First of all, we’ve got something called [the] Millennium Development Goals, which all the countries together through the UN have set themselves a goal to half the number of people who do not have clean water to drink and sanitation facilities. We’re probably going to achieve the water goals, which means the other half is left to do. There’s still at least 500 million people without clean water, but the sanitation goals do not seem like we’re getting anywhere near them. It’s actually going backwards there. There’s just a ton of more work to do. The risk is that people are focusing so much on climate change that they forget that the biggest impact possible on climate change is actually the way we have water behaving in the environment… the hydrological cycle’s changes. There’s just a ton of more work to do. The risk is that people are focusing so much on climate change that they forget that the biggest impact possible on climate change is actually the way we have water behaving in the environment… the hydrological cycle’s changes. You get more water where you had too much already. You get less where you didn’t. Actually, climate change is water. We have to think about the water situation. I think that’s going to be huge. I don’t think it’s quite penetrated yet. I don’t think people realize that. Thomas Bjelkeman-Pettersson: Thanks. It was great to meet you, Carl. I spoke with Thomas Bjelkeman-Pettersson at the Tällberg Rework the World Conference in Sweden. He’s a co-founder of Akvo.org, an online platform for connecting people that work in development aid, particularly water. To find more articles and broadcasts on water, design, policy, and related issues, be sure to tune in to Circle of Blue online at 99.198.125.162/~circl731. Our theme is composed by Nadev Kahn, and Circle of Blue Radio is underwritten by Traverse Legal, PLC, internet attorneys specializing in trademark infringement litigation, copyright infringement litigation, patent litigation and patent prosecution. Join us again for Circle of Blue Radio’s 5 in 15. I’m J. Carl Ganter.